If you remember much of what you learned in biology class, human beings are 70% water. It shouldn’t be any surprise, then, that we need water to survive. If you’re a running beginner, you’ll soon learn the value in a reliable hydration pack for those long-distance trips. If you’re no stranger to running, you know how difficult it can be to choose the best hydration pack for running to fit your lifestyle. With our help and a little experience looking under the microscope, you’ll get that much closer to choosing the best camelbak for running and for you and, perhaps, recommending products to your running companions or competitors. Purchasing a hydration pack is a highly subjective decision. There are those seasoned runners who know what to look for when it comes to capacity, storage, fit, or hydration system models. Overall Comfort: Look for where the hydration pack sits on your back, where your reservoir or bottles are stored, and how the select fabrics and materials may feel afters miles of running. Breathability: Decide what stability features are important, including but not limited to waist straps, shoulder straps, design, and material. If your pack can keep you cool and dry, the better chance you’ll enjoy your run. Size & Volume: Are you looking to camp or take advantage of other activities after a long run? You’ll want to look for a pack with a lot of storage capacity and versatility so you’re not limited as to what you can bring to keep your adventures safe and fun. In addition to our major checklist, you also need to factor in the type of running you plan to do, whether you’re prone to running in marathons or paving your own trails cross-country or up mountains. Pay close attention to exact measurements and whether the product you’re interested in runs small, as expected, or large. Unisex packs are typically reliable for stretchy fabrics to accommodate all body types. Just remember that each hydration pack can accommodate a wide array of performance levels and expectations. Pros: Easy access to water by way of a tube and a drinking valve, compact storage, and avoids bouncing or sloshing while you run. Most bladders are taste-free and BPA-free, but always double check. Cons: May be difficult to clean, some drinking valves take a lot of effort to bite down on, and these systems limit internal storage capacity. Pros: Easy front-access to water and they allow more internal storage capacity for other accessories and gear. Cons: Bottles tend to bounce while you run. This can, in turn, cause chafing or irritation after some time wearing your pack, though many manufacturers have solved this issue by providing support straps to keep your pack close and form-fitting while still breathable. If storage volume is on your wishlist, prepare to review packs that may weigh a little more. Product weight should be an important determining factor in your selection process so you can avoid carrying more than you bargained for and get back to setting new records. No matter which product is the best running hydration pack for your lifestyle, remember to stay safe and take advantage of the many preventative accessories these packs provide: reflective design, whistles, or attachments for lights. Most importantly, stay hydrated. Let’s take a closer look at some of the hydration packs runners and outdoor enthusiasts swear by! Design Features: Ripstop coated nylon material, 7-liter storage capacity, 100 oz. reservoir capacity, FloatAir back panel, gear carry system, fleece-lined eyewear pocket, 2 exterior pockets, 2 pump sleeves, detachable rainfly, and a waist belt. Description: The Platypus Duthie A.M. 10.0 Hydration Pack is an optimal choice for extremists on a budget. With three different color combinations in Carbon Envy, Moss, and Red Alloy, you can run in style without sacrificing comfort. This pack comes with internal and external organization pockets and a total storage capacity of seven liters. The included hydration reservoir features a wide-mouth valve that allows you to easily hydrate on the move as well as magnetic components and multiple hose routing options. As with any drinking valve, it may take you a few tries before landing on the correct bite to access your water easily. This pack’s water reservoir is also easier to clean than many of the reservoirs that come with competing products. Its convenient carry system allows you to stow extra gear and accessories for a full day’s adventure. The detachable rain cover allows you to stay dry in less desirable weather, and you don’t have to forfeit a good long-distance run on account of rainy conditions. Although this product costs less than many hydration packs out there, you may want to weigh its performance and storage rank before making a final decision. Related: Platypus offers similar hydration packs with different specifications. The Duthie A.M. 12.0 Hydration Pack weighs less, and the Duthie A.M. 15.0 Hydration Pack fits and looks more like a traditional backpack. Weight: 17.6 oz. or 1.1 lbs. Design Features: (2) 17 oz. soft flasks, quick-dry mesh and fabric, bladder sleeve, 1 whistle, pole holder, soft trim material to prevent irritation, safety blanket, 1 chest pocket, reflective trim, 1 back pocket, 2 side pockets, 1 battery pockets, and 1 technology pocket. Description: The S-Lab Advanced Skin3 12-Set is, perhaps, one of the best racing vests for runners who love pockets. This vest has a pocket for almost anything you can think of: lamp batteries, cell phone, clothing, snacks, etc. The kangaroo-style pouch is perfect for any last minute packing additions. With two included hydration flasks as opposed to a single reservoir, you can opt for two different drinks, and the flasks balance out the weight of any extra gear you decide to pack. The mesh material is form-fitting and avoids adding strain or pressure points so you can run without discomfort. There are just a few drawbacks to consider before buying this product. This pack is expensive compared to other packs and vests with similar features, a hydration bladder must be purchased separately, and the bladder also features a lower liquid storage capacity than competing products. But if you don’t mind paying a little more for the benefit of back relief and breathability, this product is a great solution for you. Related: Solomon makes a very similar vest, the S-Lab Advanced Skin3 5-Set Racing Vest, at a more affordable price and with just a little less storage capacity and more color varieties. For a little less carrying weight and hydration flasks as opposed to a reservoir, you can opt for the S-Lab Sense Ultra Set. Weight: 9.3 oz. or 0.58 lbs. Design Features: 2-liter reservoir with a quick release valve, nylon/polyester material, water-resistant pill pocket, media pocket, 2 front bottle pockets, side mesh pockets for holding gels, reflective lining for extra safety, and customized fitting for men. Description: For any experienced runner, chafing can be a worst-case scenario. With the VaporAir Hydration Pack for Men, you can run long distances without worrying about discomfort and unnecessary bounce. Its 2-liter reservoir comes with quick-release valve for hydration convenience. 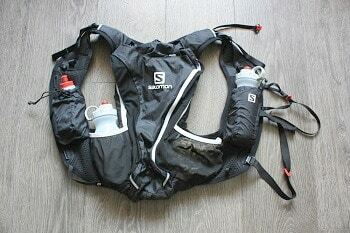 If you need extra water for longer runs, there are two pockets in the front of the pack to store extra water bottles. This product also comes in three fun color options: Electric Blue, Nathan Grey, and Electric Blue Lemonade. Although this pack actually comes with a bladder, the bladder can be difficult to clean. The strap features can also cause this pack to ride up a bit, possibly as high as your neck, which may require consistent readjusting to avoid any discomfort in the collarbone area. This race vest features a minimalist approach to hydration on the go and rings in at a more affordable price than the S-Lab Advanced Skin3 12-Set Racing Vest. Related: If you’re looking to spend less without losing storage capacity, the FireStorm Race Vest is a strong and affordable choice. While this product is specifically tailored for men, the VaporAiress Race Vest for Women has all of the same mindful features. Design Features: 7 liters of carrying capacity, 2 media pouches, 2 bottles and holsters, 4 gel or bar pouches, 2 adjustable sternum straps, 1 whistle, 6 total Velcro pockets, and bungee cords. Description: Designed by ultra marathon runner, Scott Jurek, Ultimate Direction’s SJ Ultra Vest 2.0 is a great and lightweight option for runners of any caliber. If you’re just starting out on your running adventures, this pack features two of Ultimate Direction’s easy-to-use hydration bottles with simple valves so you don’t have to work too hard to stay hydrated. The other advantage to bottles is that they even out weight distribution so you don’t overwork your back carrying a single reservoir. If you compare this vest’s hard bottles to competitors’ soft flasks, you may find that they’re bulky and can cause a bouncing effect as you run. To avoid that distraction, this hydration vest is compatible with bladders you can purchase separately, but you may find refilling quite difficult due to this pack’s side-only access. All in all, this running vest is good for those runners looking for a lightweight solution, though it’s still expensive compared to competing products with better performance results. Related: For an updated fit that was recommended by Scott Jurek after his record-breaking Appalachian Trail trek, check out the Ultra Vest 3.0. For those runners who don’t need extra storage pouches or pockets, the AK Mountain Vest 3.0 is ideal for getting back to the basics. Weight: 13.3 oz. or 0.83 lbs. Design Features: Unisex fit, (2) 12 oz. insulated SpeedShot flasks, 1.5-liter reservoir compatibility, phone pocket, reflective trim for visibility, slide-adjustable sternum and waist straps, and a small pill or battery pocket. Description: As one of the most affordable racing vests on our list, the Nathan Fireball Race Vest features almost everything you need to get out there and stay hydrated. Run bounce-free through the mountains, forests, prairies, or beaches without fear of chafing. Offered in either Bluestone or Cockatoo, this pack is stylish, sleek, and lightweight. The mesh shoulder straps are highly breathable and allow your arms to move freely as you propel your body forward and control the rhythm of your run. The included and insulated SpeedShot flasks keep liquids cooler 20% longer than other contested bottles. Like the Salomon S-Lab Advanced Skin3 12-Set Racing Vest, this product does not include a hydration bladder, but you can purchase one (up to 1.5 liters) and add it to your pack for extra water. A few other accessories you’ll lose out on with this option: a safety whistle, extra storage pockets for running necessities, and pole holsters or clips. If you’re looking for simple hydration without all the bells and whistles, add this race vest to your gear collection and get to running. Related: Nathan offers a vest just like the Fireball except with a few less storage options: the Firecatcher Hydration Vest. If you prefer water reservoirs to bottles and are willing to spend a little more, the VaporAir Hydration Pack we reviewed earlier is an alternative solution. Weight: 11 oz. or 0.68 lbs. Design Features: Weather-resistant nylon ripstop material, stretch pockets for flasks, stash pockets for salts or gels, airflow mesh vest, 2-liter hydration reservoir with hose, multiple sizes. Description: Want to stay hydrated and run as if you’re not carrying anything? Patagonia’s Fore Runner Vest 10L fits so closely to your frame that you may forget it’s even there. This option includes a 2-liter hydration reservoir and two front stretch pockets, so you can carry extra flasks or bottles for you or your running buddies. This pack’s foam and mesh back panel helps you stay cool and dry even on warmer days or under conditions of heavy sweating. The nylon ripstop design features a polyurethane coating and a water-repellent finish. One of its only shortcomings is the way this pack rests on your back. Many of the camelbaks we’ve reviewed sit high on the back, but this product sits toward the middle of the back, depending on your height and size. If you can stand the fit and are ideally looking for a pack that stays steady even on the harshest terrain, this vest is a great contender. Related: With the same total storage volume, the Fore Runner Vest 10L – 610cu in. is a comparable alternative at a higher price for performance. The Nine Trails Backpack 15L – 915cu in. has a lot more storage space than most hydration packs, so you can add any bladder you choose for hydration. Weight: 22.56 oz. or 1.41 lbs. Design Features: 3-liter reservoir capacity, tool pouch, front media stash pocket, helmet attachment, mesh front pocket, blinker light attachment capability, reflective patches for safety, mesh hip-belt, hip-belt pockets, airscape backpanel, and harness. Description: The Osprey Raptor 10 Hydration Pack is the pack you can trust on rough trails. Its LidLock clip will secure any gear necessities, like a helmet, a lamp, or a bike pump. The waist pouches are convenient for storing your favorite calorie fuel, and the pack itself is spacious while remaining lightweight at only 1.4 lbs. The mesh straps sit comfortably on your shoulders and breathe so you’re not irritated by sweat or moisture. Whether you’re running, hiking, or trail riding, you need to be visible to other enthusiasts. For this, the Raptor has reflective patches and an attachment for a blinker so you can stay safe even into the late hours. This pack is also very durable, in case of accidental trips or tumbles. A removable tool pouch is one of the best features, because it comes in its own zippered packet and is easy to access. This mountain biking pack can compete with any standard running hydration pack. Related: Alternatives to this product include the more affordable Osprey Packs Viper 9 Hydration Pack with just a little less hydration volume capacity or, the women’s equivalent, the Raven 10 Hydration Pack. Design Features: 1.5-liter hydration bladder, perforated shoulder straps, 1 chest pocket, reflective covering for increased visibility, ripstop nylon fabrics with honeycomb structure, waterproof, detachable zipped waist belt pocket, and bottle and flask holder inserts. Description: As the most affordable hydration pack on our list, the Salomon Agile 2 Hydration Pack is as minimal as they come. For what it lacks in storage space, it makes up for in versatility and movement. This pack features mesh shoulder straps and back panel, allowing your body to breathe even during the most intense workouts. The cheaper the pack you select, the less features it may include: decreased hydration volume only three liters of internal storage volume, and limited accessory pockets. If you’re looking for a super lightweight camelbak to stow only what you need, up to 1.5 liters of water in the included hydration bladder and a small snack to keep you going, this product is a great choice for keeping adventure simple no matter where your feet take you. 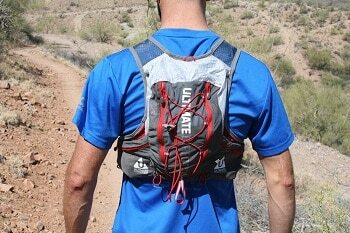 Related: S-Lab Advanced Skin 3 5 Set Racing Vest and the Trail 20 Bag. Did We Make Your Decision Any Easier? We know there are a lot of great hydration packs out there, and we’re happy to review some of the bestsellers so you know the factors and features to consider when looking to buy your next pack, because you should do so with confidence. You should buy a pack that fits your lifestyle, whether you plan to compete in ultra-marathons or pioneer new trails. As we discovered in reviewing these eight products, volume, hydration pack capacity, and overall comfort are key essentials to enjoying the product you choose. We also know running can often be a community sport, so don’t be afraid to pass on product tips and knowhow to those runners that are just starting out or those seasoned enthusiasts who swear by only a few products. If you think we forgot to mention any of the other great hydration packs out there, please let us know in the comments.